The first part of Visions of Vanaheim introduces us to the path of Vanatru. Vanatru, according to Svartesól (the editor and primary author), is a faith which focuses primarily on the Vanir deities, without necessarily excluding the Aesir; Vanatru is seen as one of various heathen paths, and by no means as a homogenous or monolithic movement, which is also mirrored in the variety which fifteen co-authors bring into the book. A certain preference of Anglo-Saxon culture is said to be prevalent among Vanatruar, though. The history of the Northern countries is also presented as a timeline starting from 500,000 B.C.E. to provide a background. Part two carves out the distinction between Vanir and Aesir cult, followed by portraits of the Vanic deities. Quotes from primary and secondary literary sources are followed by personal experiences and UPG, often including a short essay by one or several contributors, followed by a poem, invocation or prayer. Each chapter begins with a compilation of often lengthy citations which presents an unwieldy introduction to the text. The interconnection between the quotes and the following personal thoughts and beliefs is made, but not as thoroughly or consistently as one might have wished. Whether or not one agrees with the opinions and viewpoints that transcend what can safely be deducted from the lore will (of course and as always) vary with the reader. The prayers and poems are straightforward and lend themselves well to personal use. The first deities discussed are Frey, Freya and Njordh, which according to the sources are explicitly Vanir indeed. Then follows Nerthus, who may be arguably regarded as Vanic if one follows the well-known argument that she was Njordh’s sister and/or wife. The author lists further deities which are considered Vanir within Vanatru, but about which the extant lore is silent about their origins or tribal associations: the Scandinavian Sif, Idunna, Eir, Ullr, Gullveig, Gersemi, and Hnossa; the (semi-)mythological humans Frodhi and Wayland; the Southern Germanic Holda; Nehalennia of the Netherlands; and Herne the Hunter of the English folklore (resp. Celtic mythology). What is perceived in these beings are Vanic qualities relating to the land and its fertility, wellbeing and peacekeeping. The portrait section ends with deities considered Vanir by marriage or adoption into the tribe: Skadhi, Gerda, Frey’s servants Byggvir and Beyla, Skirnir, Heimdall, Sigyn, Sunna, and Mani. The book’s third part is about Vanic practice in the here and now, and includes a broad scope of rituals for all kinds of life events and rites of passage; articles on altar building; prayer beads; the runes from a Vanic viewpoint; healing; drumming; utiseta; and thoughts on Vanic sexuality and warriorship. Descriptions are given of nineteen different altars, all illustrated with black-and-white photographs. The rituals and suggestions are practical, down-to-earth, and inspiring and can certainly be used or adapted for one’s own needs. They show the many possibilities in both individual and collective worship. The fourth part features essays from five authors about living their lives with the Vanir. These are very open and highly personal testimonials of profound devotion and the deep impact that relating to the Vanic deities has had, and continues to have, on these writers. The texts explain why it was Vanatru which became their way, and demonstrate the variety of possible relationships with the divine, the dimension of evolution within that relationship, and the concrete changes in real life that can follow the inner changes. While these texts may not inform the reader’s own life or faith as directly as the other parts of the book, they round off the book nicely. A glossary and authors’ bios conclude the book. 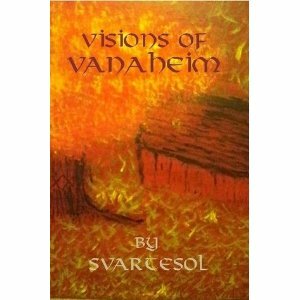 Visions of Vanaheim is a concerted effort of devotion and love, and with 565 pages it is among the most comprehensive heathen books at the present time. While UPG is duly declared as such in many cases, there still is a plethora of undeclared statements throughout the book which are either assumptions, uncommon interpretations, or which stand in direct opposition to (at least parts of) the lore. Therefore one would hesitate to recommend the book to someone not already having at least a firm basic knowledge of the relevant sources. While the table of contents shows a sensible structure, it’s more difficult to discern this structure when actually reading or leafing through the book. The author devotes time to explaining that Vanatru means a Vanic-centered way, which does not necessarily exclude the Aesir, and that it certainly doesn’t and shouldn’t mean bashing the Aesir. However, the book left me with the overall impression that many texts give undiscriminating and uncritical praise to the Vanic deities, their domains and intentions; in contrast “the Aesir” (meaning mostly Odin, and to a lesser extent Thor; Tyr or others are not dwelt on) subtly but persistently come across as a war-mongering, unreliable-to-dishonest, and somewhat ridiculous tribe, whose achievements within the pantheon are second to those of the Vanir. In summary, Visions of Vanaheim is surely worth a careful and discerning read, and it is useful as a resource to pick out the good thoughts, rituals, and inspiration for one’s own adaptation. That usefulness may be weighed against both the time necessary to peruse such a substantive volume, and the price. It’s not a beginner’s book (except, perhaps, for one who already feels a strong pull towards Vanatru). But it most certainly is an interesting insight into yet another movement within heathenry.